When life has you climbing the walls. Come try climbing ours. Whether you need a break from the corporate climb, are tired of the social climb–or just want a new reason to climb up off that couch and get moving–we’ve got what you’re looking for. Our 30ft. indoor climbing wall is designed to accommodate everyone, from the beginner to the experienced climber. 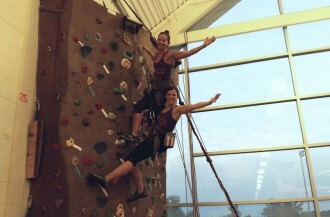 Climbing provides a fun, full-body work out that combines precision, strength, and balance. 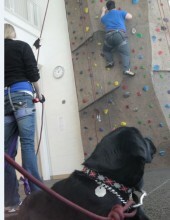 There are three ways to experience the climbing wall. Spend quality time with that special child in your life or squeeze in an intense workout by scheduling a 30-minute climing session at the member serivice desk. 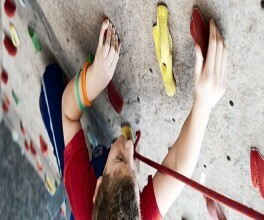 Learn a specific aspect of climbing by taking part in one-hour skill workshop, see the climbing department for details. Join a five-week climbing class, taught by qualified instructors to learn safety, knots, equipment, climbing technique, and conditioning at your level. Members may purchase a punch card. Please see member services for details. Please fill out the Climbing Wall Waiver Form found at the bottom of the front page of our website under the "Forms" tab. please go to schedules on the front page of our website.